A rare talent, her music is raw and organic. She has been compared to the likes of Eryka Badu and Lauryn Hill and has a MOBO Award under her belt. Despite the continuous growth of her international presence and the plaudits she is getting, Nneka says her music is not about the plaudits or accolades. It is about the LOVE. In her own words, Nneka Egbuna on life, politics, race and responsibility, and love. Belinda: What has musical journey been like since you won the Mobo award back in 2009? Belinda: Were you expecting the Mobo Awards or did you just go along saying to yourself, whatever happens, so will be? Nneka: I never really focus on winning awards or doing music because of any goals. I just do it by heart. I do it for the love and what comes, comes. It came suddenly and it surprised me. It definitely surprised me. Belinda: As individuals, even as children, some people have that defining moment when they make up their mind as to what they will do with their life. Did you have a defining moment when you knew music was the way to go? Nneka: Music is something that I have loved and it is something that I do from my heart and I never considered it to be a job or profession. Let’s say it was never my goal or dream to become a musician. I loved music but I never saw myself as a professional musician and that I would be doing it the way I am doing it at present. Definitely, everything just happened the way it happened and things fell into place. Belinda: Who are your influences? Nneka: Fela Kuti, people like Bob Marley, Nina Simone, a lot of Nigerian traditional musicians, Victor Uwaifo, Sonny Okosun. These are people I look up to; people who do music not for the money or the fame or for popularity but more about change and trying to make a change within Africa, outside Africa and the world. People who do music and have a message in their music – whatever you do, do it with your heart. Belinda: Is it right to assume that these are the same kind of people whose music speaks to your soul and spirit? Belinda: Speaking of inspiration, what inspires you as an artist, musician, and songwriter and as a human being? Nneka: I would say life in general, growing up in Nigeria, my living in Nigeria, a very intense place and living here inspires you on a daily basis and the chain of things and changes that have happened in my life. I mean growing up n a ghetto and all of a sudden, people are taking make seriously. That drastic change has influenced my perception of life and my life in general. I didn’t ever think it will go this way. And of course the people I meet on a daily basis, the pain, the misery, and the happiness within that misery, everything basically in life and the movement of life and the hatred in this world. Belinda: The music industry works in hyperbole and gives things labels. How would you describe your music? Nneka: My music is very fertile, very mixed, has a lot of influences, Afro-beat, soul, reggae, very authentic and simple. Belinda: You grew up in Nigeria but at what point in your life did you move to Germany? Nneka: I didn’t move to Germany. I spent a little time there because of my studies and that was where I got my record deal. I was always in-between Nigeria and Germany. Like the last 4/5 years but now I live in Nigeria. Belinda: Now that you are back in Nigeria, going through a transition, what has that transition been like, as you shuttle between two worlds, and how is that shaping the lens with which you see the world? Nneka: It is crazy. It’s very confusing at times and at the same time, it is very inspiring. I just have to handle it and at the same time, I am just trying to get used to it. It is difficult to be honest because I am not used to it. Belinda: How challenging was it to combine your studies with music when you were a student? Nneka: It was difficult because I was very much on tour and came back, in-between classes, write an exam and fly out again. It was very difficult doing three things at the same time, studying, going to work and doing music. It was very stressful but you know if you want to achieve something, you put everything into it, all your ambition and you must discipline yourself. It was a tough time but I got my degree and it was good. Belinda: Your videos are patriotic as you have Nigeria and images from Nigeria in the background. Is there any particular reason why you do that and use Nigeria as the backdrop your videos? Nneka: That’s because I am here and also the songs that write, have a lot to do with the politics of Nigeria and a lot to do with Africa and this is who I am. Maybe I will eventually do a video in Europe or America or wherever but I am just a simple person, for whom the whole focus is about getting the message across. I don’t invest a lot of money in flashy stuff. The aim is to catch people’s heart and touch people’s heart but if there is more money in circulation, I might do that. Belinda: You talked about your childhood and how that has influenced you and of course, you are from the Niger Delta. Hence, what is it about the Niger Delta and your heritage that makes it crucial and core element of your music? Nneka: The music is the only way that I am able to express what is happening back home. In fact we arrived here with a band for a concert for a charity for the Niger Delta and we are here for a peace concert and there are going to be a lot of people and politicians here, who are going to have to listen to what I have to say. This is the place where there is a lot of turmoil, rivalry, tribalism and there is a lot of corruption and oppression because of the oil issue, and the big oil extraction companies that come here and take our oil and exploit the area and leave the people. So it’s a big thing and the world has to be concerned because it alls connected. At the end of the day, America stands, England stands and the Western world stands because of Africa. Africa is the source and Africa is the key. The root of the pillars that hold the western world is Africa. Belinda: In your songs, you call Africans to action and take responsibility. You are doing a lot of straight talking. Is that another message you want to send out with your music and who are you speaking to, through your music? Nneka: Basically, it is to the world. We are all part of one entity, its all about change and it’s about realising that the solution to every pain and everything is love. Love heals everything, no matter what anyone has been through and where they are coming from, the message is love. Belinda: There is something that is organic about your music and raw and also comes through in your music videos. Why do you keep it so raw and real? Nneka: I think maybe, because I direct the videos myself and though I work with other people, I have a picture in my mind that I always want to realise. The truth is all the videos that you see, I directed it myself. So you can imagine there is not much budget and I am trying as much as possible to reflect the message within my music and get my message across despite the fact that I have a low budget, (a hearty laughter from Nneka) I don’t really have enough revenue to get my message across the way I would want to. It could be better than the way you have seen it but this is the best way that I can do it for now. Nneka: It’s not only because of the budget. I have seen other Nigerian music videos and no body would think it’s African. It’s so crazy that we just go for these flashy videos, if you see the videos now, there is nothing African whatsoever in it apart from the fact that they are speaking Pidgin English. It’s a bit sad because there is nothing about our culture that is being transmitted or our tradition or love for our country. People are ashamed to show certain pictures. I see Nigeria, I love this country and I am showing that in the suffering and what we are going through, we have happiness, and no matter what people are going through, the little they have, they are happy. There is nothing wrong with showing the good side but the reality of it is that these things are happening. Yes, we as Africans must tell our stories and you cannot tell the good and deny the bad. You have to admit the bad to make it better. Belinda: Different people have said different things and have described you as an activist, superb songwriter and others say you are a socio-political fighter with a bone to pick. So let me ask you, which one are you? Nneka: I no know oh! Me I just dey do my music. I am just doing my own. Seriously, if anybody wan follow me, let the person follow me. I am just being me and I am stressing issues that have to do with the people around me. If they are political, if they are religious, if they are…whatever they consider it as, it is fine. It’s all about the heart and feeling. Belinda: In one of your songs, Something To Say, you were talking to someone, whereby you talk about the different issue going on in the Niger Delta. What was going through your mind when you wrote that song and if I go out a bit, what is it that you want to examine, explore and expose through your music? Nneka: That song is about the conscience. That every man and human being has a conscience and a voice that speaks/talks. If you are doing wrong or if you are disrespecting another man’s dignity because you are being free or feel free then your conscience comes in and tells you that what you are doing is not right. It’s all about realising and listening to that conscience when it says what you are doing is not fair. Belinda: There is another track that stood out for me and it’s fair to ask what inspired it as it is a very strong track on the issues of race and identity. What inspired the song, Half-caste? Nneka: What inspired it is basically the fact that I have seen many mixed race kids growing up abroad, not knowing their African identity and not being able to accept their African identity. I have seen white women who married black men and tell their kids at the end of the day that their father was not a man because he betrayed me or because he had another black woman and he decided to go back home and leave her after he got the passport. So, everything African and the aspect of that child that is African is negative and condemned as not good by that mother. I have seen many kids like that, growing up in Germany and not really knowing where they belong and not integrated into the German society for instance and at the same time, not being able to go back home and say, I’m black, I am African. So that inter-racial challenge and conflict between two worlds and not belonging to anyone of them is what I am talking about. Belinda: Are there any other challenges that you have encountered and would like tackled in the Nigerian music industry that you would like to see change? Nneka: First of all, when it comes to movies and video, the sound. When it comes to music, the equipments and when it comes to the technical aspect. It needs to be mastered. We have the equipments but the people don’t have the knowledge to do it properly at times…sometimes everything is extreme and they don’t really have the skill to execute things on the technical side of music and also, when it comes to performing live, a lot of Nigerians hardly perform live. They just go for playback, people pay a hell of money to come and see people perform and all you do is mime and play playback and go home with loads of money. So, I am trying to promote the idea of playing live with a live band and showing true authentic talent. Belinda: The title of your album, No Longer At Ease is also the title of a book by Chinua Achebe. Were you aware of this when you were picking the title or if it was just a co-incidence and is there a story about how the title came about? 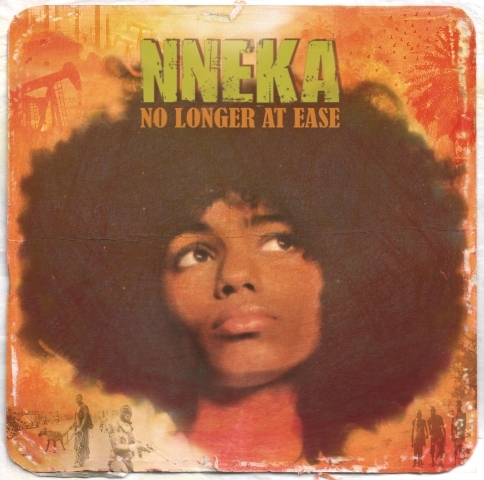 Nneka: I had a couple of them going but No Longer at Ease because that was the way I felt at that point in time. Eventually I found out and I remembered that No Longer At Ease was a book I had once read and I went back and read the book and it was strange that the content of the book was similar to my life experience and story. It was co-incidental and strange, and Chinua Achebe and Wole Soyinka are people I look up to. Nneka: You know what, I’m m mixed race. I am half Nigerian and I am half German. So, basically, I do music for the African and western part of me and if there is a language that the white part does not understand, okay. I dedicated those ones to Nigeria. I also write the songs down in the booklet, so people will understand what the song is about and when I am on stage, I also explain on stage to the white audience what the song is about and what I am talking about. Belinda: What is the appeal of singing in Pidgin English that you like and admire as singer being that it’s got rhythm and it’s melodic in its own right? Nneka: Pidgin is what I feel and it’s the language that I feel and that’s why I do songs in Pidgin English. I couldn’t sing a song in German because I have tried it before and I don’t feel it. And I know there are many people who understand Pidgin English. In Sierra Leone, in Ghana and it’s similar to the Nigerian one. Belinda: There is something that is hunting about your music because of the message that come through, hence, when people listen to your song, what do you want them to take away from it? Belinda: Where do you feel most at home, on the stage, in your own space, writing yours songs etc, which one? Nneka: Wow! That’s a good question. I feel most at home when I am connected to God, myself and my music. I don’t know about the geographical aspect but the spiritual aspect, it is when I am connected to God and my music that is when I feel at home. Belinda: What does the stage do for you, what do you get from being on the stage? Nneka: A lot, sometimes, nothing and it depends on how I feel that day. Belinda: Let’s look at the world we live in as your music speaks to the world. What is it about the world right now that breaks your heart? Nneka: That we all call God, the same mouth we use to pray is the same mouth that we use to curse and it’s the same mouth we use to declare war, which is contradicting. Belinda: If there is one thing that you can change about society and humanity, what would it be? Nneka: You know what? I don’t think I’ll change anything. I won’t change anything. It should be the way it is because at the end of the day, we are going to end up where we began and that is cool. Belinda: What is your next plan in terms of going forward, what is the next agenda the artist, going forward? 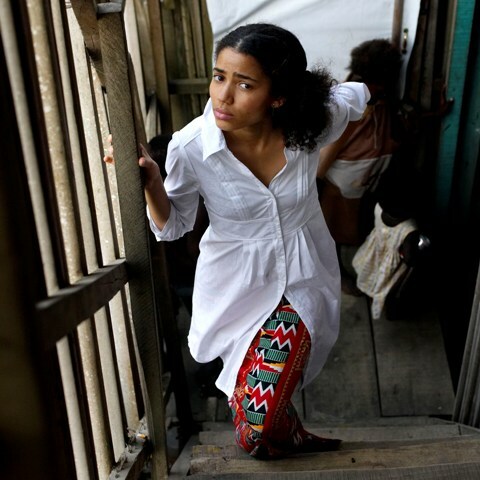 Nneka: Touring, recording albums and living life. This entry was posted on Monday, July 19th, 2010 at 2:57 pm	and is filed under Africa, Interviews, Journalism, Music Reviews, Nigeria, People, Politics. You can follow any responses to this entry through the RSS 2.0 feed. You can leave a response, or trackback from your own site. Any one who can portray a purposeful message in their art, is written for good in my books. It’s the reason why I’ve always been drawn to Nneka’s music, and I doubt that will change any time soon. So she directs her own videos? Wow, I LOVE her videos…through this interview, her talent/gift has even expanded in my knowledge. Good to know that she currently resides in Nigeria. I would rather she keeps doing her videos in Nigeria, rather than Europe of anywhere overseas. It conveys her message better. Oh, never in the world would I have guessed any of the videos were low-budget, it’s the quality that matters. You have a way of bringing out things in the light in your interview, I mean things that I haven’t discovered about writers and artistes anywhere else. Kudos! LOVE: You can sense it in her songs; it sure keeps the passion alive! Nneka is a wise and fearless young woman. Interesting interview! Have you seen the CNN interview with her? I like the way she speaks too…very Nigerian nuances. Thanks Temitayo. Yet, to watch CNN interview…I have been meaning to go on the CNN website, since it aired. Yes, she does speak with the nuances peculiar to Nigeria. We had a good a laugh when I interviewed her.